There are approximately 700,000 senior citizens in our state. The Kentucky State Data Center at the University of Louisville found people age 65 have grown 23 percent since the 2010 census, while the number of people younger than 65 has declined and they account for over 15 percent of our population and growing. Investigators with the Alcohol Research Group assessed trends in marijuana use between the years 1984 and 2015. Authors reported that, compared with older Americans 30 years ago, older respondents today are some 20 times more likely to acknowledge using cannabis. This suggests the stigma of cannabis from drug war propaganda has been eroded and education is reaching seniors. 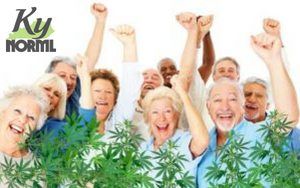 Seniors, with the benefit of life experience, professional knowledge, and 20/20 hindsight, are potentially our strongest allies in the fight to end Marijuana prohibition. We urge our Commonwealth’s seniors and their loved ones to take action and contact their state representatives by calling 1-800-372-7181 and letting them know they support cannabis reform in Kentucky. To support KY NORML you can DONATE HERE and follow us on Facebook and Twitter! Your donations help pay the bills and allow us to function and continue to make a difference in our state! Can you kick in $5, $10 or $20 to help us keep going?